Broad Notes Indian Writing in English Indo-Anglican Literature Poetry Nissim Ezekiel's Indianness or Indian Sensibility in "The Night of the Scorpion"
Nissim Ezekiel's Indianness or Indian Sensibility in "The Night of the Scorpion"
Though Ezekiel has been criticized as being not authentically Indian on account of his Jewish background, and urban outlook, he could see the essential India in the urban climate of Bombay where he was born and brought up. As he said the Indian writers “Have to make a synthesis between ancient and modern cultures”. In his own poems he tried to achieve a remarkable cultural synthesis between the Jewish and the Indian, the western and the Eastern, and the urban and the rural. Villages are the backbone of India. Ezekiel‟s The Night of the Scorpion depicts a typical Indian village in flesh and blood. The relationship, especially the human relationship is the strongest among the villagers. This is the most ideal humanitarian aspect of village life. Unity of all religions in India is seen here. Peasants of various faiths, Christians, Hindus, Muslims, and Jews came in large numbers to see her and prayed for her. The priest is the representative of God in most Indian villages. 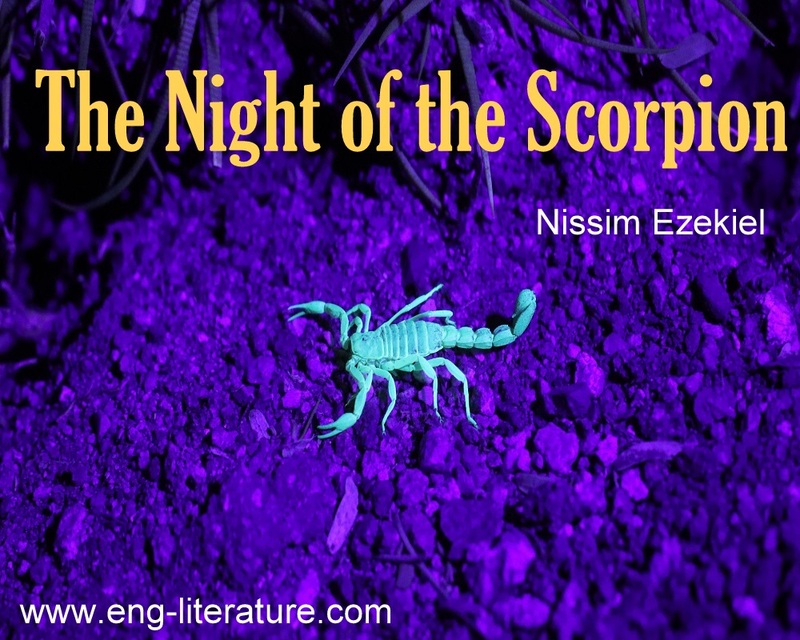 In Night of the Scorpion also, Nissim brings the priest to execute the divine act of destroying the evil through rituals. Indian tradition is rich in spiritual myths and ideologies. The belief in the previous birth and the next birth, and the relevance of the “karma” and the consequent sufferings in the present life, form the basic concept of Hindu mythology in Indian background. Through the voices of the peasants, the poet echoes the Indian belief in washing away their sins of their previous birth by suffering in the present birth. are very beautiful and a befitting portrayal of a typical Indian mother. The concluding lines mesmerize and define the Indianness impressively in Nissim Ezekiel as it brings out the authentic flavor of India, though his poems are simple, introspective and analytical. Finally, in respect of Indianness, James H. Cousins says that Indian poetry in English is: “Indian in thought, Indian in emotion, Indian in imagery and English only in word.” In the words of Nissim Ezekiel, “My poems in Indian English are rightly described as very Indian poems. So they should not be considered as “mere lampoons”.